Last month, the Bulletin of Atomic Scientists announced that it had moved its so-called Doomsday Clock three minutes closer to midnight. The Doomsday Clock is internationally recognised as an indicator of how close we are to destroying ourselves with advanced equipment and technologies, most importantly with nuclear weapons. August this year marks the 70th anniversary of the destruction of Hiroshima and Nagasaki by United States (US) nuclear weapons. Now more than ever, countries with nuclear weapons need to read the signs of the times by reflecting deeply on current events and responding to them appropriately. Nine states currently possess such weapons, namely the US, United Kingdom (UK), China, France, India, Israel, Pakistan, North Korea and Russia. In contrast, 115 states or some 60% of United Nations (UN) member states, including all African states, have committed to not producing, acquiring, testing or possessing nuclear weapons. According to the Stockholm International Peace Research Institute (SIPRI), the nine states above own approximately 4 000 operational nuclear weapons and a combined total of about 16 300 nuclear weapons. While none have been used since 1945, Robert Gard – a retired army lieutenant general – says that in the US at least 1 200 ‘significant’ accidents involving nuclear weapons occurred between 1950 and 1968. Furthermore, in 1980 a dropped wrench led to a fatal explosion of a nuclear missile in Arkansas, and in 1961, two nuclear devices were mistakenly dropped over North Carolina – but luckily did not detonate as they had not been ‘armed’. 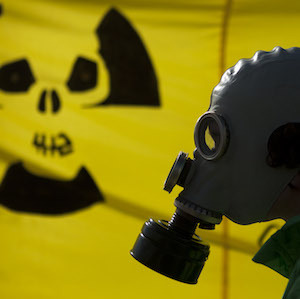 Last year, in a message to the December Vienna Conference on the Humanitarian Impact of Nuclear Weapons, Pope Francis questioned the ethical basis to the so-called doctrine of nuclear deterrence, stating that the ‘ethical and humanitarian consequences of the possession and use of nuclear weapons are catastrophic and beyond the rational’. He added: ‘If it is unthinkable to imagine a world where nuclear weapons are available to all, it is reasonable to imagine a world where nobody has them. ‘Nuclear deterrence and the threat of mutually assured destruction cannot be the basis for an ethics of fraternity and peaceful coexistence among peoples and states.’ He thus joined the majority of the world’s states in calling for nuclear weapons to be banned ‘once and for all’ – even though for years, and especially during the Cold War, the Catholic Church accepted that the concept of nuclear deterrence was morally justifiable. Pronouncements such as these have gravity in Africa. Since 1970, Catholicism has seen a global shift southwards, with a recent study showing that the continent's Catholic population is now at more than 175 million. It is little wonder that the UN-based Africa Group also called for the development of a legally binding instrument to prohibit nuclear weapons. The Pope, however, is not alone in calling for the elimination of nuclear weapons. At the same meeting, which followed similar events in Norway in March 2013 and Mexico in February 2014, some 158 governments, numerous international organisations and various civil society groupings outlined the catastrophic humanitarian consequences of the use of nuclear weapons. These changes come at a time when the Republic of the Marshall Islands has sued all nine nuclear weapon states, accusing them of violating their duty to negotiate the elimination of nuclear weapons. They further allege that this exposes Marshallese communities to the dangers of nuclear arsenals and the probability that other states will want to develop such destructive weapons. Further, in a recent letter addressed to parishioners of the UK’s Church of England, the House of Bishops called for a proper debate on Trident (Britain’s nuclear submarine fleet), stating that ‘shifts in the global strategic realities mean that the traditional arguments for nuclear deterrence need re-examining [and that] the presence of such destructive capacity pulls against any international sense of shared community’. Nuclear weapons states would do well to read the signs of the times reflected in recent developments ahead of the forthcoming 2015 NPT Review Conference. They need to be open and transparent about what steps they will take to achieve and maintain a nuclear-weapon-free world. They also need to urgently announce a time-bound commitment to prohibit and eliminate nuclear weapons in light of their unacceptable humanitarian consequences and associated risks. Progressive governments, international organisations such as the International Committee of the Red Cross (ICRC) and global civil society, including in Africa, have vowed to ‘identify and pursue effective measures to fill the legal gap for the prohibition and elimination of nuclear weapons.’ Taking the lead from one of the outcomes of the Vienna Conference, they have pledged to ‘follow the imperative of human security for all and to promote the protection of civilians against risks stemming from nuclear weapons’. As Peter Maurer, President of the ICRC recently stated, ‘reducing the risk of nuclear-weapon use and ensuring their elimination through a legally binding international agreement is a humanitarian imperative, and it is time for states, and all those of us in a position to influence them, to act with urgency and determination to bring the era of nuclear weapons to an end.’ Now is the time for the nine nuclear weapon states to join this endeavour.